Konjac low-carb spaghetti (or shirataki noodles) is perfect in a stir-fry where their delightful bouncy texture delivers a pasta-like bite similar to al dente. 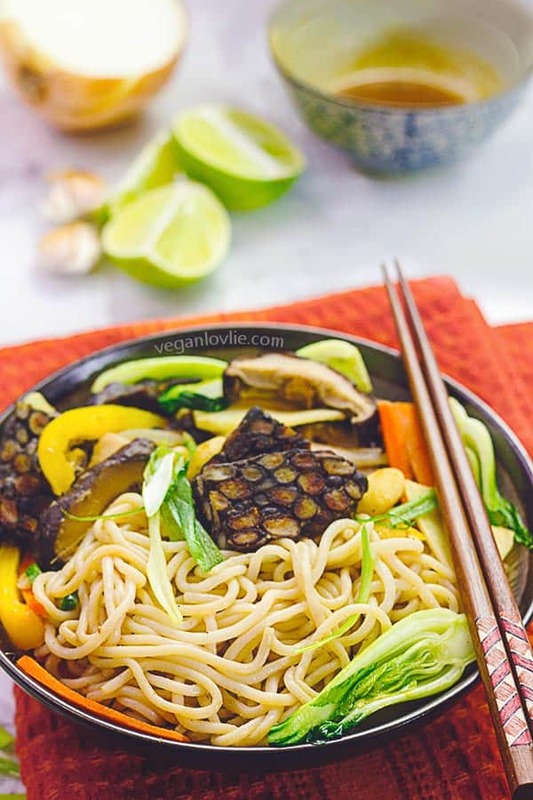 Toss in some vegetables and black bean tempeh, all seasoned with a homemade vegan hoisin sauce, and you can enjoy a flavourful low carb meal in relatively little time. This post is sponsored by nuPasta. Read below for full disclosure. Pasta is a much loved staple of so many tables around the world. I don’t personally know of anyone who doesn’t like a good pasta dish. Do you? I think if one would possibly turn down a pasta meal, it would most probably be because of the high carb content or gluten sensitivity, and not because of the taste, nor the long lasting satisfaction. Kevin and I have recently been enjoying a new brand of pasta and I wanted to share our experience with you as we feel it’s something you might like too. So we’ve decided to partner with nuPasta for this recipe. This is a brand of low calorie, low carb pasta, available in Canada, made with konjac and soy flour. It is basically a fibre-based pasta instead of the usual starch-based. This keeps the calorie count in these noodles very low, with only 25 calories and 6 g of fiber per typical 210 g serving. That’s about 1/10th the amount of calories in regular starch-based pastas and 3 times the amount of fibre. Konjac noodles, or also known as shirataki, are not new to me. 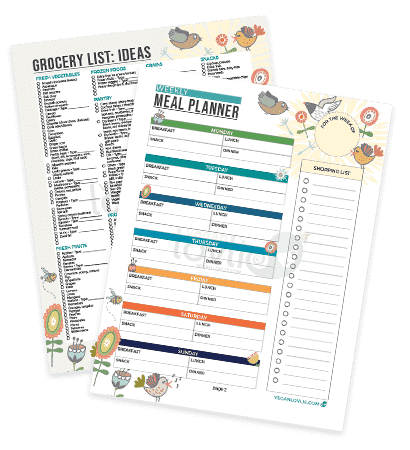 In fact, a few brands can now be found on the shelves of many regular grocery stores. I’ve tried a couple of brands myself out of curiosity and also because I recognised the main ingredient – konjac – which I sometimes buy in the form of a gelatinous block, known as konyakku, at the Asian grocery store. It is sometimes flavoured with seaweed flakes and has a very chewy bouncy texture that doesn’t lose any of its shape while being cooked. Konjac food is very popular in Eastern cuisines but not as much in the west. The konjac plant typically grows in Japan, Korea and China. The edible part of the konjac plant is the root which is pretty similar to an oval shaped taro or yam potato. Konjac is composed mainly of glucomannan, a water soluble dietary fibre. The main characteristic of konjac is that it has zero calories. So, it is one of the few foods that you’ll expend more energy chewing than receive in calories. Aside its low calorie properties, it has numerous health benefits. Gluccomannan fills the stomach and slows the digestion process which creates a feeling of fullness without a lot of calories. Being a dietary fibre and not a starch, glucccomannan helps to control blood sugar level, also reduces cholesterol and regulates bowel movement. Read more on the benefits. 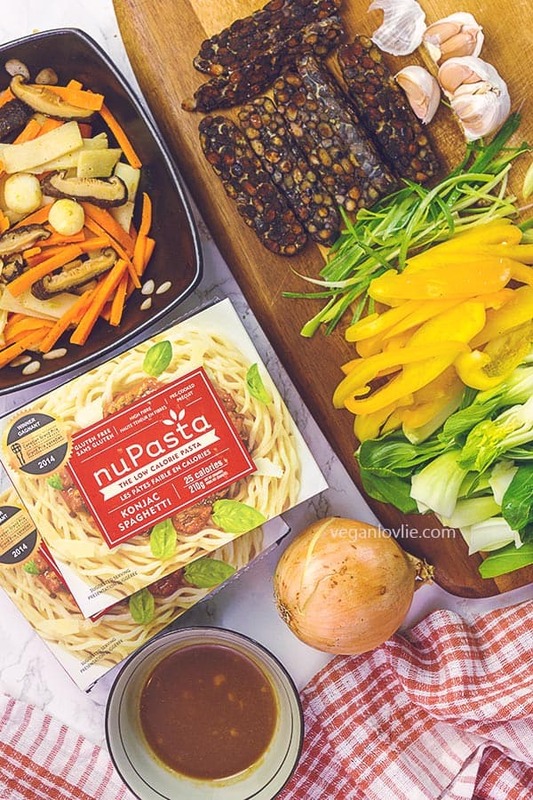 What we like about nuPasta is that it is less bouncy than other konjac noodles, with a texture and taste much closer to regular pasta – something that we find mostly appealing. The noodles still do have a delightful bounciness to them that is quite like al dente pasta, i.e. firm to bite. So, it is not a bad thing given that the extra chewing allows you to expend some extra calories without adding them on! Since the main ingredient is konjac, the fibre content in nuPasta keeps you full and satiated for a long period of time, which makes it especially great for those trying to manage their weight. nuPasta comes in two lines of products – regular and organic – with 3 varieties of noodles in each – spaghetti, fettuccine and angel hair. They all taste the same just different shapes. The calories mainly come from the soy flour which results in zero net carb. These noodles contain no preservatives and are pre-cooked, so they just need reheating and are ready to eat in a matter of minutes. Another thing that I like is that they come in packages that are shelf-stable, just like regular dried pasta, making it very convenient with storage and cooking. nuPasta is available in the health or pasta aisle in many regular grocery stores in Canada. You can also order it online from the nuPasta website with free delivery. One small thing to note, you may notice a slight seafood-y smell with the noodles when you’ve just opened the pack. This is characteristic of the konjac itself. Once thoroughly rinsed and reheated or cooked, the smell simply goes away completely. Though the virtues of konjac are usually favoured by dieters, those with gluten sensitivity, managing diabetes or high cholesterol or who are on a fitness regime, aside its low-caloric properties, I think konjac can well be appreciated simply because it’s delicious! 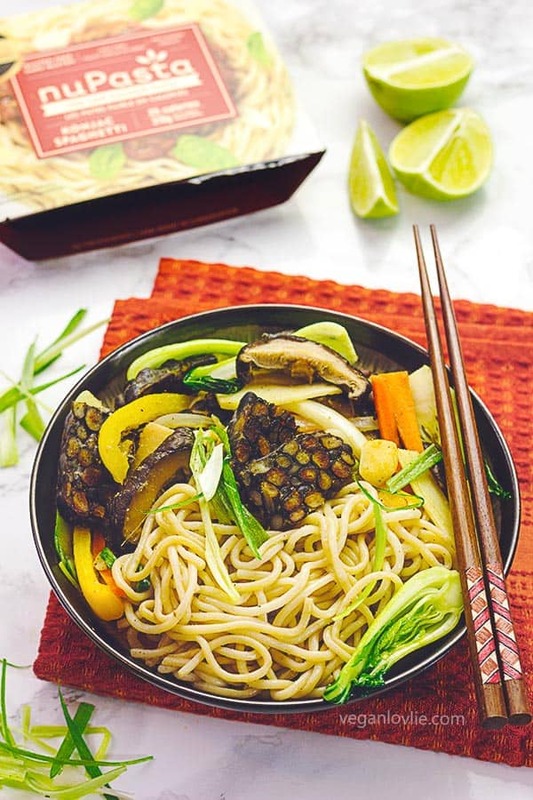 Today we are introducing the nuPasta spaghetti in a vegetable stir-fry with our homemade black bean tempeh, all seasoned with a vegan hoisin sauce made from scratch. For the black bean tempeh, just follow the same process in our tempeh-making tutorial and substitute the soybeans with black beans. To make this recipe gluten-free, use tamari (instead of soy sauce) or check out our own homemade soy-free gluten-free “soy” sauce substitute. Watch the video as Kevin demonstrates the easy process of making this low carb spaghetti stir-fry. Rehydrate the shiitake mushrooms in a small bowl of hot water. Set aside. Meanwhile prepare the other vegetables. Once the shiitake is rehydrated, remove the stems (if they are too tough) then slice them. Make the hoisin sauce by mixing all the ingredients to a smooth paste in a small bowl. Set aside. 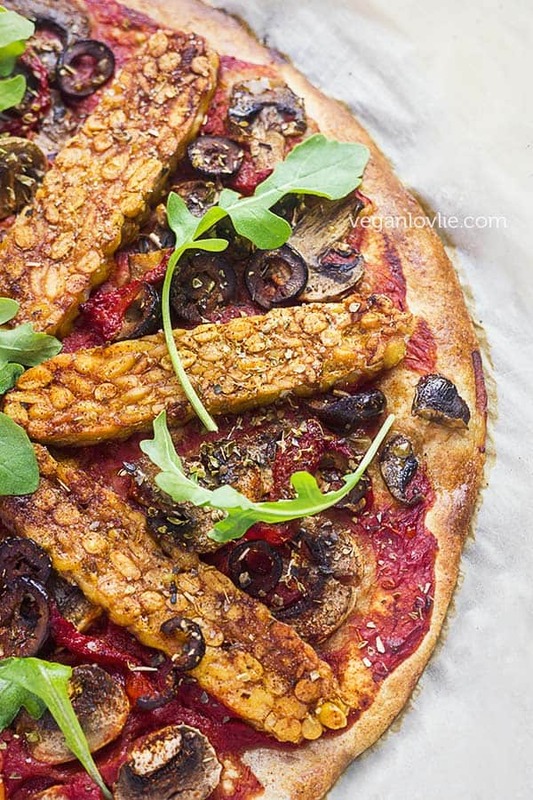 Slice the tempeh into strips. Heat a skillet, wok or sauté pan on medium-high temperature. Add 1 tablespoon coconut oil. 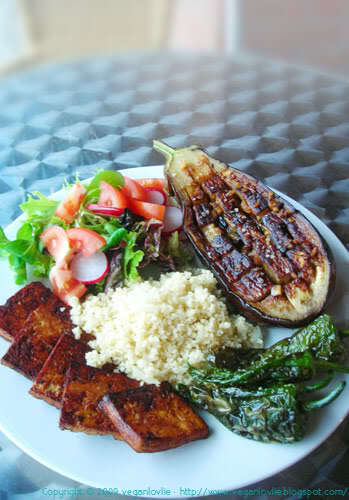 Place the tempeh strips in the skillet and pan-fry until crispy on one side, about 5 – 7 minutes. Flip and fry for another 4 – 5 minutes. Drizzle some soy sauce or tamari (for gluten-free version). Cook for 1 – 2 more minutes then remove from the pan and set aside. You may cut the tempeh in half across once they are lightly cooled. You may continue cooking in the same pan if it is large enough. Still on medium-high heat, add one tablespoon coconut oil to the pan. Add the onions, garlic and minced ginger. Saute for 2 minutes. Add the sliced shiitake mushrooms. Saute for about 5 minutes. Add some soy sauce or tamari (or homemade soy sauce substitute). Next add in the carrots, followed by the water chestnuts and bamboo shoots. Stir fry for about 4 – 5 minutes. Add the bell peppers followed by the hoisin sauce. Stir fry for another minute. Add the nuPasta spaghetti, the bok choy and the fried tempeh. Toss and stir fry for a couple more minutes, just enough to reheat the noodles. You may add a few dashes of soy sauce to adjust the taste and for colour. Lastly add the spring onions or scallions. Sprinkle some freshly cracked black pepper to taste. Serve immediately with a wedge of lime to squeeze on. Konjac low carb spaghetti is perfect in a stir-fry where their delightful bouncy texture delivers a pasta-like bite similar to al dente. 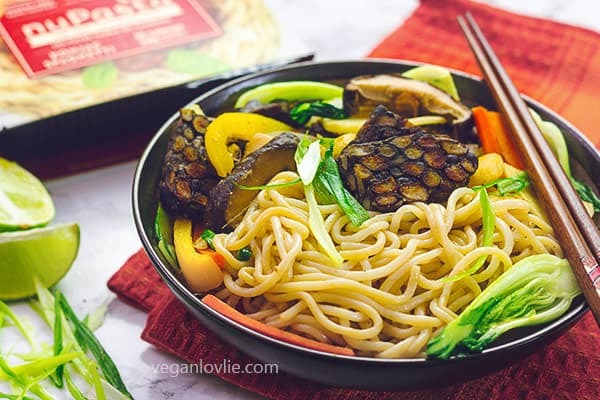 Toss in some vegetables and black bean tempeh, all seasoned with a homemade vegan hoisin sauce, and you can enjoy a flavourful low carb meal in relatively little time. Use less water in the recipe, since nuPasta is pre-cooked. Then just add the pasta as per the recipe. The fettuccine variety is ideal for pho in my opinion as it is similar to the flat rice noodles. Just reheat the pasta for 1 minute in some boiling water, then add to your pho. This is even quicker to make with spaghetti nuPasta since you won’t have to cook the noodles. Just reheat them in the coconut curry broth itself for 1 minute before serving. 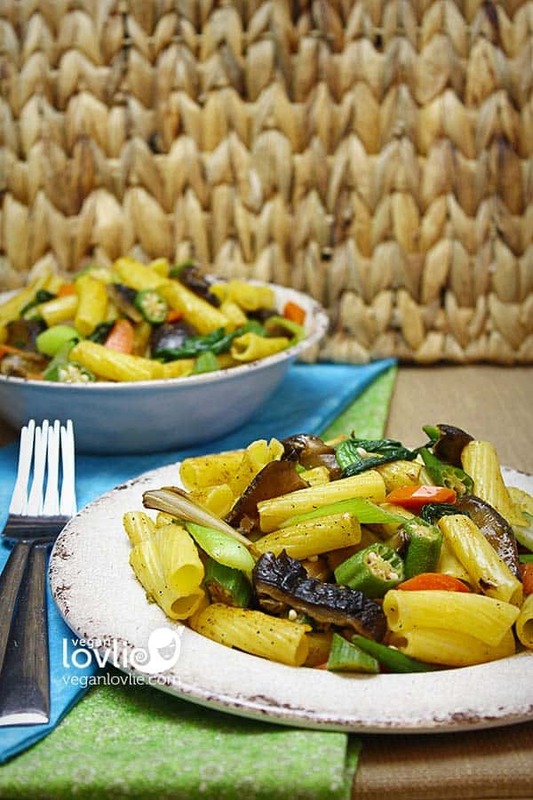 If you try any of these recipes, don’t forget to tag us @veganlovlie #veganlovlie @nuPasta #nuPasta on Instagram or Twitter. Or post a photo to our Facebook page. Full Disclosure: This post is sponsored by nuPasta. We only endorse products and services that we like, enjoy, use and that we believe, based on our experience, are worthy of such endorsement. We value the trust of our readers and subscribers. We believe in honesty of relationship and opinion. We received a selection of nuPasta products and we were also compensated for our time. The views and opinions expressed on this blog and in the video are 100% ours. Medical Disclaimer: The information provided in this post and video is sourced from the nuPasta website and the internet. The post and video do not claim the information provided is totally accurate and reliable and will assist everyone with their dietary needs nor do they provide medical advice. The purpose of this video/article is merely to inform visitors and share alternative food stuffs. You are therefore advised to consult your registered medical physicians as a matter of due diligence before consuming any new products if you are unsure or have certain medical conditions. Any product claim, statistic, quote or other representation about this product or service should be verified with the manufacturer or provider.